There are many ways to cook a deliciously tender and juicy steak. However, regardless of whether you like it fried, grilled, broiled or cooked sous vide, whether you prefer your steak rare, medium or well done, whether you like filet mignon, top sirloin, rump or ribeye, there is only one way to achieve perfection. A steakhouse-quality meal always starts with a top-quality cut, which you can now easily order online, thanks to the wonders of the 21st century.Thus, if you are in search of a trustworthy supplier of the finest meat for your show-stopping steak dinners, you have come to the right place. Get ready to discover the best mail order steaks America has to offer. If you want your steaks to be organically raised and beaming with natural flavors, go with US Wellness Meats. Choose from 30+ premium steak cuts and enjoy regular discounts and free shipping. 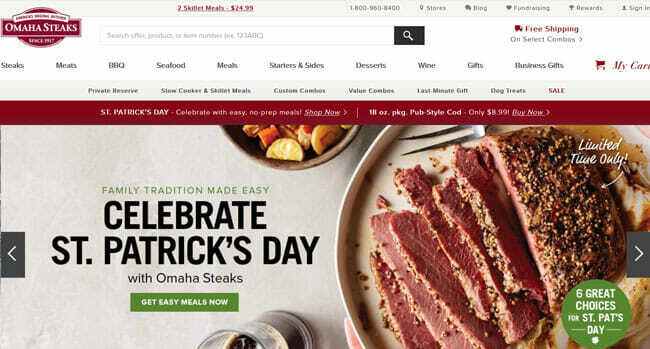 Omaha Steaks has been providing premium steak cuts since 1917. Choose from dozens of steak options and get all the luxurious extras that can elevate your meals at a price you can afford. Chicago Steak Company is a mail order steak service that focuses on USDA Choice and USDA Prime steaks. Enjoy hand-cut dry-aged and wet-aged steak cuts of exceptional flavor and texture. Snake River Farms is a top-notch mail order steak company that allows you to enjoy American Wagyu, dry-aged, and Northwest beef steaks whenever you wish, with no minimum order limitations. Kansas City Steaks offers over 100 steak items, including classic, USDA Prime, American-style Kobe, and grass-fed cuts. Buy steaks individually or in multi-cut and multi-course-meal packages. Getting flavorful, hand-cut steaks via mail used to be a luxury reserved for the rich. Fortunately, this is no longer the case. Nowadays, even if your budget is tight, you can handpick and order your favorite steak cuts online and have them delivered whenever you need them. Specialized staff that masterfully handles your steaks. With mail order steak services, you no longer have to limit your choice to just several, possibly stale steak cuts available at your local supermarket. You can choose from dozens of freshly crafted steak options, add them to your shopping cart in a click, and simply wait for them to arrive at your doorstep. No compromises, no time wasted, and plenty of gas money saved. Since these services cooperate with a limited number of handpicked farms, they can guarantee invariably high quality at all times. Unlike stores that may switch between suppliers at any time for profit-related reasons, mail order steak companies strive to build reliable farm networks in order to maintain their customer base. Finally, the fact that they focus on steaks means that they have highly trained staff that handles every cut with skill and care. This is an important advantage, as narrowly specialized professionals always do a better job than jacks of all trades (masters of none). After all, most people would rather have their car fixed by a trained mechanic than a guy who generally services fridges and dishwashers but also handles cars every now and then. The same logic applies to crafting steaks. In comparison to other companies of the same kind, the best mail order steak services boast richer offers, higher meat quality, better customer service, and more adequate pricing. Plus, they offer additional perks to enhance customer loyalty. When you opt for one of the best mail order steak companies, you can expect to browse over 50 or even 100+ steak cuts. You can choose from different quality and marbling levels, enjoy cuts aged for up to 28 days, opt for freshly chilled or frozen depending on your preferences, and simply decide on every detail that affects your cooking and dining experience. You can pick steaks based on type, farm or diet, try out new options or get hard-to-find favorites, never settling for a cut that is not a perfect fit for your needs and palate. What is also important is that you do not have to spend more than you want and order more than you need. The best mail order steaks come in convenient, multi-sized packages and their prices are always justified by meat quality. Furthermore, the highest-ranked companies never impose problematic limitations, they do not require you to purchase steaks every week or month, and they do not set order minimums that would force you to order dozens of pounds of meat at once. Finally, with the best mail order steak services, your orders, requests, and complaints are handled by friendly company representatives who are willing to go out of their way to ensure you are perfectly happy with your order. Deliveries normally come with a satisfaction guarantee and discounts are highly common. On top of that, these services may offer additional products that steak lovers like to have in their fridge or pantry. These can include special sauces, rubs, spice mixes, and other items that can make it easier to cook a thoroughly impressive steak dinner. Many passionate steak lovers know how to recognize a good steak based on color, smell, marbling, and other physical properties. However, with mail order steaks, the selection process is a bit different due to the intrinsic limitations of online ordering. Still, there is no need to worry. We have a couple of tricks up our sleeves that can help you easily decide which mail order steak company is worth your trust and money. Here are the essential qualities we focus on when devising our list of the best mail order steak services in the market. First, it is crucial to check how many steak products the company has in its offer. If its online shop features just a few cuts that you can find at any store, it is not worth a try. Mail order steak companies should have you spoilt for choice and you should settle for nothing less. The availability of other meat types and cuts is certainly a nice advantage that we factor into the company’s final score. Since you cannot see the steaks in person, you should be able to learn all about their quality based on the information on the company’s website. The best mail order steaks are not just photographed well and vaguely described as delicious, they come with plenty of details about the farms they come from and the way they are raised and handled, so you know what you are getting in your deliveries. While in-house testing can help us decide whether the steaks are as good as advertised, we never feature any companies that do not allow you to make the right decision based solely on the information they provide on their sites. When figuring out whether the steaks are of high quality, be sure to check if they are properly labeled (e.g. USDA Prime, grass-fed or organic) and if there is enough information on their origin. You may sometimes want to eat a steak without any sides, seasoned with salt and pepper only. Still, it is nice to know that the service you opt for can provide all the additional elements that can make your meal even more enjoyable. We generally choose mail order steak companies that also offer suitable sides, marinades, rubs, and even seafood and other types of meat. That way, they allow you to easily assemble a full meal, make a perfectly juicy marinated steak, enjoy some surf & turf delights or throw a majestic BBQ party without having to shop elsewhere. While we do not mind if the steaks on offer come from some of the most reputable stockyards, we do prefer companies that directly cooperate with small, family-run farms. We also make sure that the meat is sustainably sourced and humanely raised, free from hormones and antibiotics, and fed a healthy, non-GMO diet. In terms of flexibility, the key aspects to check out include minimum order, availability of auto-delivery or subscriptions (if desired), ease of modifying or canceling potential subscriptions, and possibility of ordering without obligations or contracts. We always choose companies that allow you to shop at your desired frequency, with no obligations or unnecessary limitations. Our goal is to identify the companies that offer premium-quality steaks that fit most budgets and come at prices that correspond to their quality and uniqueness. After all, even if a steak is of exceptional quality and it is not available in supermarkets, it should not come at a price that is three times higher than the average. Thus, our list of the best mail order steaks never includes anything that is overpriced. We make sure that you can base your final choice on what fits your budget, without wasting time on determining whether the price is justified or not. In the final section of our guide to choosing the best mail order steaks, we will offer more valuable information on our top picks. Keep reading to find out what makes our top-ranked companies special and decide which one you want to try out first. US Wellness Meats provides superior-quality beef steaks that come from grass-fed cattle raised in accordance with the principles of organic farming. Its steak selection is not as impressive as that of our previous choice, but you can still choose from over 30 popular cuts. 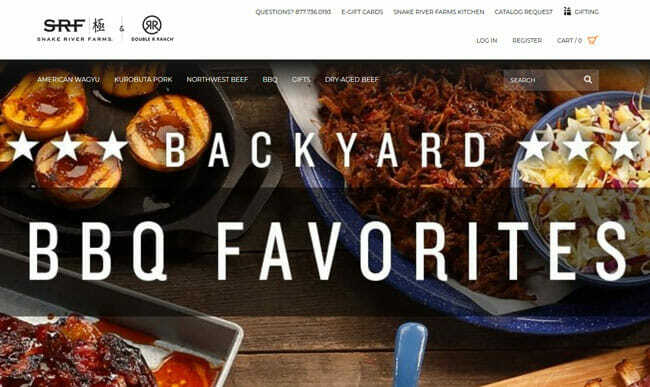 The company offers an incredible range of extras, including wild-caught seafood, bison, pork, lamb, and poultry, as well as farm-fresh dairy, pemmican, organs, bones, fats, broths, gelatins, nutraceuticals, and other unusual items. Shop commitment-free and enjoy frequent discounts. Shipping is free and you only pay a small handling fee. For over a century, Omaha Steaks has been one of the finest and most trusted mail order steak services in the country. In order to satisfy all customers, it offers both premium and budget steak cuts, hand-crafted in-house. Its selection mostly includes naturally raised and aged steaks, with a wealth of popular cuts available, from T-bones to strips. In terms of extras, it offers seafood, meals, sides, desserts, wines, and more. You can shop as often as you want, there are no order minimums, and every delivery comes with a satisfaction guarantee. Chicago Steak Company is a mail order steak service that specializes in premium, aged steaks. Whether you prefer Angus beef, USDA Prime or Wagyu, dry-aged or wet-aged cuts, you can find it all at Chicago Steak Company. One of the main advantages of this service is that it allows you to enjoy the highest-quality cuts that are better than 98% of steaks available in the US. Apart from steaks, you can purchase chicken, pork, fish, surf & turf items, and amazing desserts. There are no minimums or obligations to spoil your shopping experience. If you want to get regular deliveries, you can join a steak club and get free shipping. Snake River Farms is a premium choice for fans of American Wagyu, Northwest, and dry-aged beef steaks. The selection is rich, with about 50 steak items available at all times. This company’s cuts are praised by some of the best chefs in the country and they can be enjoyed in various Michelin-starred restaurants, which speaks volumes about their quality. Apart from amazing steaks, the service offers Kurobuta pork and delicious BBQ cuts. Ordering is easy, you can shop whenever you wish, there is no minimum order, and the prices are rather fair. All orders come with a happiness guarantee. Kansas City Steaks boasts one of the vastest selections of premium steaks on the market. With over 100 steak items on offer, you can be sure that this exceptional service can satisfy your taste. Whether you opt for USDA Prime, American-style Kobe, sandwich steaks, pre-seasoned steaks or classic Kansas City steaks, you can be sure that the cuts are hand-trimmed and wet-aged to perfection. If you want to enrich your meals or dinner parties, you can add a variety of extras to your cart, including seafood, pork, lamb, chicken, turkey, meals, sides, appetizers, and desserts. You can opt for one-time orders with no minimum limit or join a monthly steak club. Your every order comes with a satisfaction guarantee.